WASHINGTON — Blue Origin said May 14 it suffered a setback in the development of its BE-4 engine with the loss of a key hardware component of the engine in a recent test. In a pair of tweets late May 14, the company said it lost “a set of powerpack test hardware” for the BE-4 on a test stand at the company’s West Texas test site in a May 13 incident. “Not unusual during development,” the company said, offering no other details about what caused the accident, or any damage to the test stand or other equipment. The powerpack is a key component of a rocket engine that includes the turbomachinery that pumps propellant — in this case, liquid oxygen and methane — through the engine. The BE-4 powerpack generates about 75,000 horsepower, getting its power from a small engine called a preburner. Blue Origin has been testing BE-4 powerpack systems since 2014, according to past company statements. The company has been gearing up for tests of the full BE-4 engine, once planned to begin in 2016 but which company officials had more recently been saying would begin in the coming weeks. 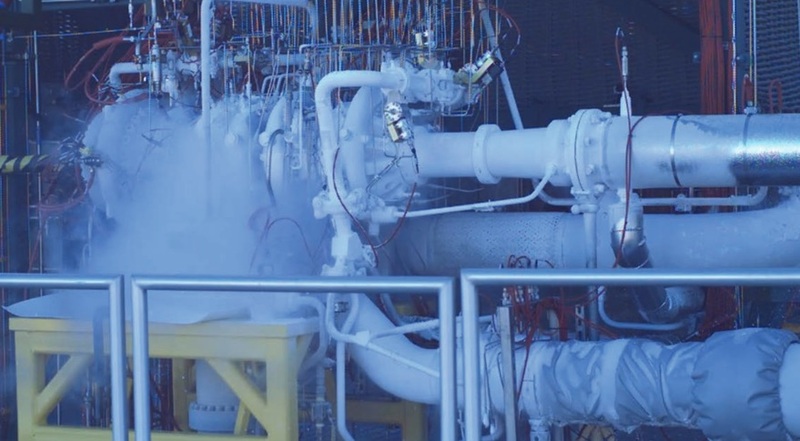 The company announced in March that it had shipped the first BE-4 engine from its headquarters near Seattle to its Texas test site. The company, in the second of two tweets about the accident, said it would bounce back quickly. “That’s why we always set up our development programs to be hardware rich. Back into testing soon,” it stated. Blue Origin executives have emphasized that “hardware-rich” nature of its testing program even before this mishap. “We really wanted to go into the test program hardware-rich,” Rob Meyerson, president of Blue Origin, told reporters at the 33rd Space Symposium in Colorado Springs April 5. The company, he said, had two test stands for testing either the full BE-4 engine or its powerpack. At that time, he said, the first BE-4 engine was on a test stand and the second and third engines would be shipping “soon” to the test site. “We want to have three engines in the queue,” he said. “We believe with two stands, a hardware-rich program, lots of sensors and great tools and great people, we can move through the test program quite rapidly,” he said. Blue Origin is developing the BE-4 engine both for the company’s own New Glenn orbital launch vehicle as well as for use on United Launch Alliance’s planned Vulcan rocket. While full-scale testing of the BE-4 has been delayed, Tory Bruno, president and chief executive of ULA, said in an April 5 interview at the Space Symposium that the engine was still the leading candidate for use on Vulcan. The other option for ULA’s Vulcan is the AR1 engine under development by Aerojet Rocketdyne, which uses a more conventional combination of liquid oxygen and kerosene propellants. Aerojet announced May 8 that the AR1 recently completed its critical design review, several days after reporting successful tests of a full-scale preburner for that engine. Those milestones, the company said, keep the engine on schedule for certification in 2019.